I have such a fun and creative project for you today that you will love. 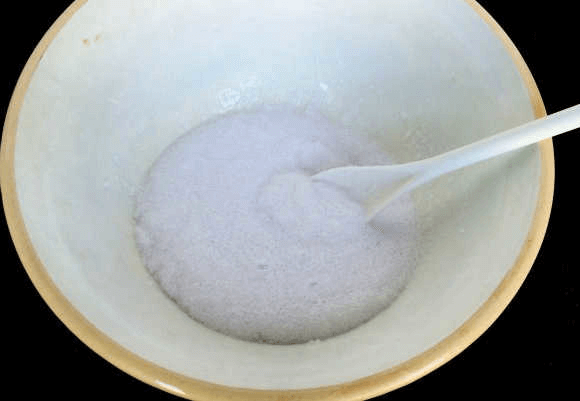 Learn how to make homemade bath salts that are luxurious and will leave your skin so soft and smooth. Have you ever made a homemade bath soak? If not, you are missing out. After I saw how much you loved my homemade lemon sugar scrub, I knew I had to show you how to make this bath salt recipe! It is so easy and just as decadent and wonderful as the sugar scrub. Now, I am not a big “bath” person, but I know that bubbling bath salts are very popular. I have a friend that has been stressed and under the weather lately, so I thought I would try my hand at making some homemade bath salts as a gift. 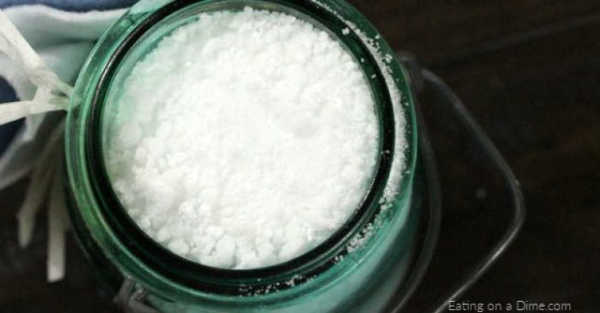 Bath salts start with Epsom salt and you can add essential oils and other ingredients to make this your own. How do you make bath salts at home? It is so easy and inexpensive you will never buy store bought again. Plus, I love knowing exactly what is in the things I am giving my family to use. We love to use essential oils but some people like to use food coloring to make the bath salt a certain color. You will love this homemade bath and especially after a long day. Let’s get started with this easy Homemade bath soak recipe! That’s it! I bought everything at my local grocery store except for the essential oil but I also love to get things on Amazon to save time and money. I only use Young Living Essential Oils. They are high quality, pure oils and I have come to really like them. There are a variety of oils and combinations of oils that I thought would be good for these bath salts, so I decided to go with lavender essential oil. Lavender is well known to bring relaxation to the mind, body and spirit, so it seemed like the natural choice for my this homemade bath soak. Making these bath salts is really easy. I mean, really very easy. Are you ready for the instructions? 1. 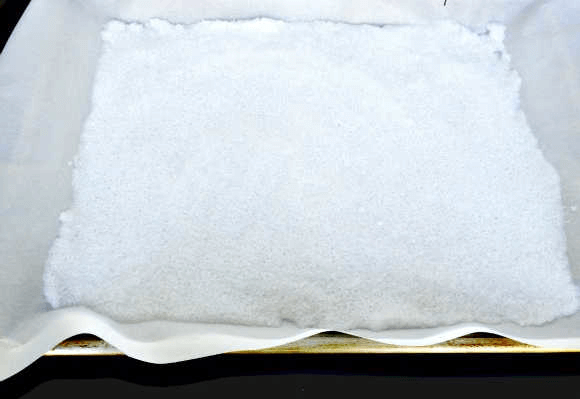 Line a large cookie sheet with parchment paper and spread out your homemade bath salts evenly. You’ll want to let them dry out for several hours, or until they are back to salt consistency.We were having a warm day, so I just set my tray outside for a few hours. 2. Mix everything together in a large bowl. You will have a very wet mixture. I know, these don’t resemble what you would think of as “bath salts”.Don’t worry, we’re not done yet. Once you have everything mixed and you are happy with the aroma, you’ll need to let this dry out. 3. Every now and then I would go and stir everything up to make sure it was all drying out. Once all of your salts are nice and dry, place them in an air tight container. 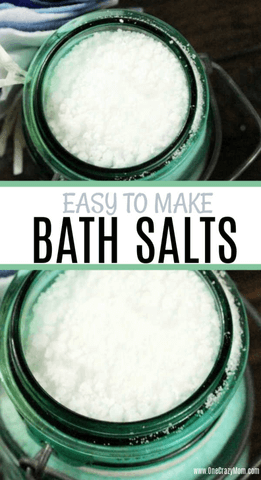 You can store these homemade bath salts for up to about 3 months. I used about half of a bag of epsom salt, which cost about $3. I used about 1/3 a bottle of VO5 shampoo, which was on sale for $0.68. The olive oil and lavender oil were negligible because I already had them on hand. I also happened to have this cute glass jar (it was an old antique store rescue from years ago). So, it cost me about $2 to make these homemade bubbling bath salts. If you don’t yet have Lavender Essential Oil, it will be a little bit of an expense at first, but it will last you a very long time. I probably use Lavender more than any other oil and I swear the little bottle seems bottomless. 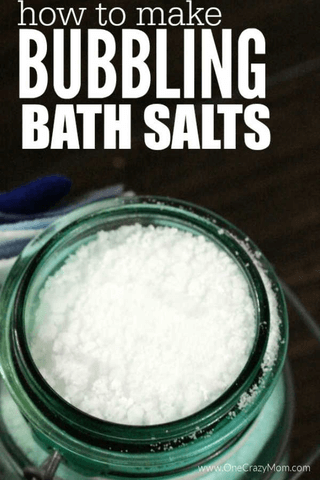 Considering bath salts run about $15 at the average retail store, making scented bath salts yourself will save you BIG bucks! There are so many different options. Make sure you read my post on how to use essential oils. Try some of these other options and you can have lots of variations to sell. Which one do you think would be your favorite? Do you already have a combinations of oils you use to help you get a good night’s sleep? Why not use those when you make this fizzy bath salts recipe! You can also try making a bath salt recipe with baking soda for a fizzy bath. So relaxing! A hot bath is so relaxing and the salt adds the benefits of magnesium to the detox bath. The benefits of magnesium sulfate and magnesium chloride are amazing for your body. I love to get pretty containers and make the entire experience like a spa. They say presentation is everything and bottles are fairly inexpensive to use for gifts. Mason jars also make really cute jars for bath salts. Why not make a bunch of bath salts ahead of time and give them as gifts to family, friends and teachers? 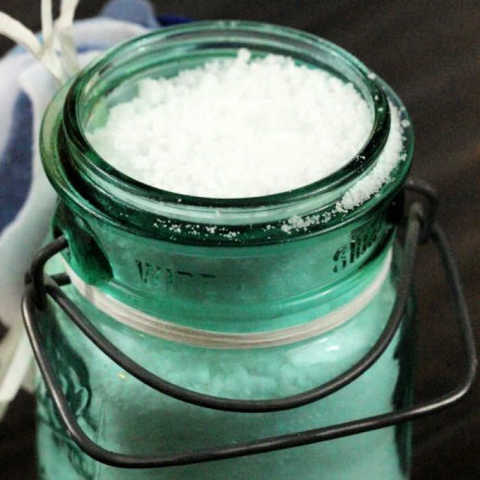 I bet anyone would be more than happy to receive these homemade bath salts as a gift. Try making these yourself and let us know if you use lavender or a different essential oil. I can’t wait to hear from you! Could you used bubble bath in place of the body wash/shampoo? How much should I use for a bath? Sounds very easy to use as a foot soak too!